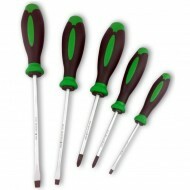 Stahlwille DRALL screwdrivers were developed for professionals faced with new challenges on a daily basis. Development for the Stahlwille DRALL screwdriver range focused on three crucial user requirements: durability and reliability, safety in use, pleasant to handle. These requirements are met in full by DRALL Screwdrivers - in fact they feel so natural, you will hardly notice them. Bahco ERGO screwdrivers also available including Heavy Duty/Tekno+, 800-series, blade through, ratcheting, precision, T-handles, hex key sets and folders.